UPDATE 9/13/2015 @ 6:31PM, Ernie Felice passed away quietly in his sleep. His greatest joy over the past few years had been knowing that there have been so many new fans of his music. I have made it a point to read each and every one of your emails to my dad with the stories and feedback about his music that you shared with me. Dad was thrilled to know that he had many fans from the world over: Finland, Germany, Scotland, England, Switzerland, Brazil, Australia, Japan and more. I had joked to my dad that I think he was more popular now than he was when his career was at a high point. Thank you all, especially to the many who have become my dear email friends with whom I communicate with regularly. Hopefully his music will continue to find even more fans for years to come. Browse the links above to learn about Ernie Felice, his career, to hear song samples and to watch short videos with Ernie Felice. 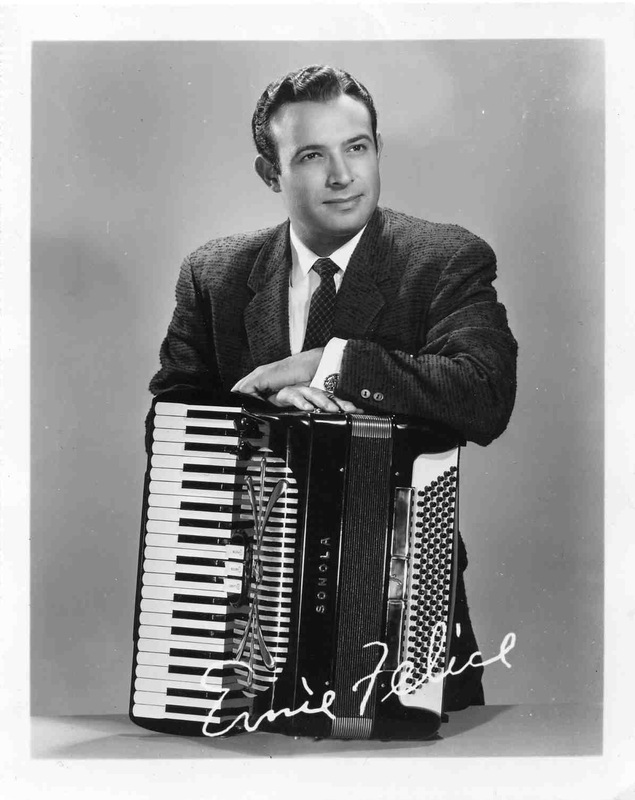 In short, Ernie Felice was a brilliant accordion prodigy who once was part of the Benny Goodman band (during an interview at Benny's house, Ernie so impressed Benny that Benny immediately signed Ernie to his band) and who worked closely (and was personal friends) with Henry Mancini (musical director at Universal), Ray Heindorff (music director at Warner Brothers), Alfred Newman (music director at 20th Century Fox) and Les Paul (Les and my dad started their own record label call F&P Records). When doing his many studio movies, Ernie's quartet was the featured musical talent in movies featuring the likes of Doris Day, Bob Hope, Ray Milland and others. 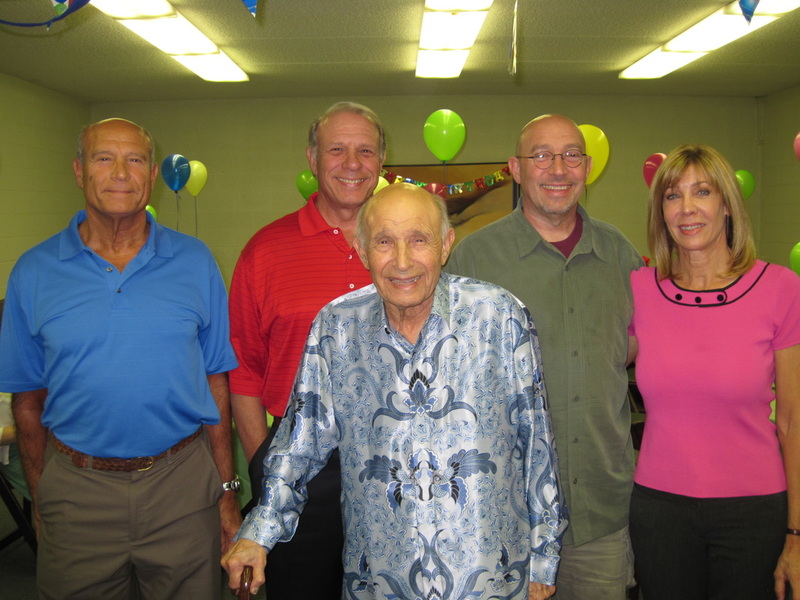 Below, a short video covers the accomplishments of Ernie Felice. ***Please scroll to the bottom of this page to stop the music that you hear before playing this video. 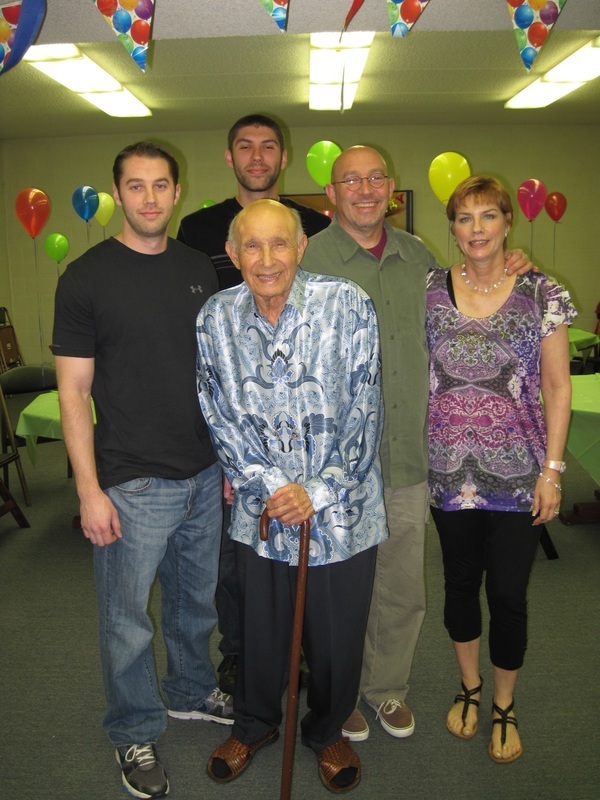 BELOW: DAD CELEBRATES HIS 90th BIRTHDAY! FAMILY AND RELATIVES HELP CELEBRATE. 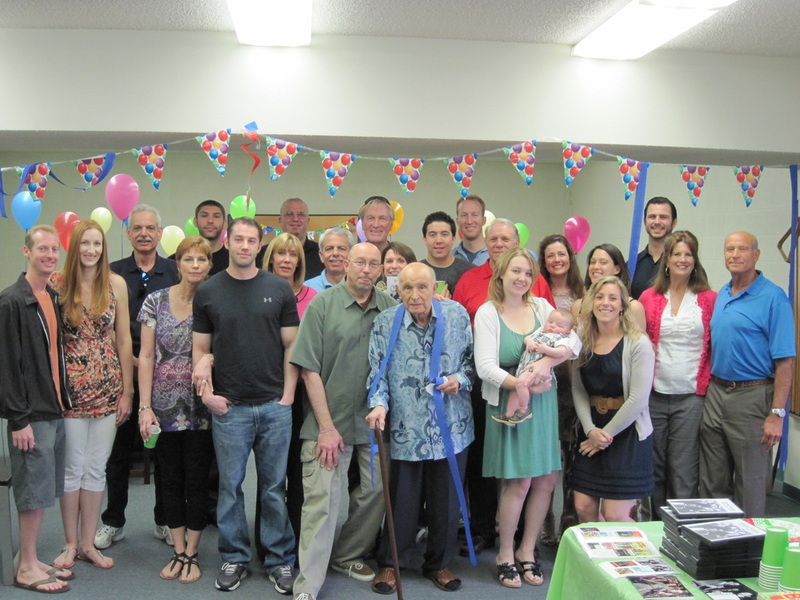 Our dad turned 90 on April 11, 2012! See him at his birthday, below. This site is dedicated to him! Below, my dad Ernie in the center with me (Dan in green shirt) left of him. Yeah, I'm the bald one with his tongue sticking out like an idiot. My oldest son Peter is to the left of me and my wife Wendy is just to the left of him with our youngest son Evan standing tall to the upper left of Peter. Then my oldest brother Ernie in the red shirt to the diagonal right of my dad and my second oldest brother Gary to the far right in the blue shirt. My sister Vickie in the pink top is just behind to the right of my son Peter. All the other great folks who joined are husbands, wives, sons or daughters of my brothers and sister along with their children. Two of my cousins (Henry and Paul, my dad's oldest sister's children) are here too. Below, my dad, me in the green shirt, my sister Vickie, my oldest brother Ernie in red and my brother Gary in Blue. My dad, my sister Vickie, my oldest brother Ernie in red and my brother Gary. Below, my dad, me (Dan in glasses), my wife Wendy and our two sons Peter and Evan. PLEASE CLICK ON LINKS AT THE TOP OF THE PAGE FOR THE BACKGROUND, HISTORY, PHOTOS, MUSIC AND FOR ORDERING CD'S.